You can access Payment Post by one of three ways, the first is to click the Payment Posting button on the main screen, the second is by clicking the Payment Post tab at the top, the third is to double click the customer from the Customer Grid on the main screen. To Post a Payment click the "Post Payment" button. A screen, as shown below, will appear. Lets take a look at the different options available when Posting a Payment. Payment - Select the Payment type as Cash, Check, or Other. When Cash is selected, the field marked Cash will default with the word "Cash". When you choose Check, this field will become the Check Number field and prompt you for the Check Number being presented by the customer. When you choose Other, this field will become Payment Description and prompt you for a description of the payment type. Payment Type - Select the Payment Type as Regular Payment, Interest Only Payment, or Principal Only Payment. By default all payment calculation is done using a Simple Interest calculation, so your payment type will reflect this accordingly. 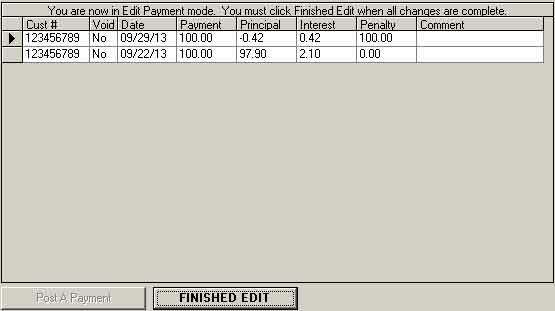 Penalty Amount - Set the amount of any penalty fee applied to this payment. Payment - The actual amount of the payment. Comment - Add any comments along with this payment record. Once the Payment is setup you can click the "Cancel Payment" Button to cancel out of the payment screen and not post the payment, or the "Post Payment Now" button to finish posting the payment. A two part receipt will appear on the screen similar to the one shown below. The receipt has two sections, one is intended for your inhouse records, and the other should be supplied to the Customer for payment. Please Note: The receipt contains Receipt Number! This Receipt Number can be verified against the database for accuracy in order to prevent fraud. To Edit previously posted payments, or to void a payment click the "Edit Payment" button. You must have manager level access to use this option. A warning message will appear. Click "OK" and a grid listing the Customer Payments will be available for editing. When changes are complete, click the "Finish Edit" button to recalculate the customer balances. Please Note: USE EXTREME CAUTION WHEN USING THIS UTILITY. 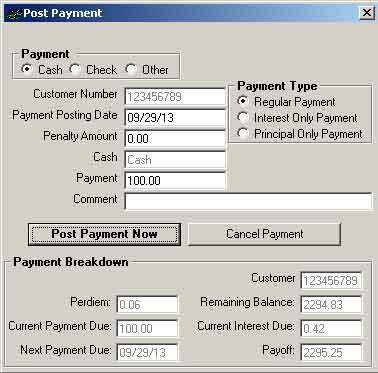 Changing payment dates and amounts will influence the balances that show on the Customer account. The Payment Posting section of the program has three Payment Breakdown tabs at the bottom. You can review the customer Retail Installment Payoff, PreComputed Payoff, or Card File Payoff. The Retail Installment Payoff tab shows an instant breakdown of the customer under a Simple Interest calculation. You can find the Perdiem, total Current Interest Due, and total Current Payment Due. This screen also shows the Remaining Balance along with the Payoff amount. The Payment Made Report button will produce a report showing a breakdown of the customers payment history compared to the payment schedule. Here is an example of the report with payments made on time. The Acs Buy Here Pay Here software calculates all balances on a Simple Interest calculation. If a Customer was contracted with a precomputed contract, this button will provide a screen, as shown below, for payoff based on this calculation method. Clicking this button again will remove the display screen and reveal the list of made payments. The third tab is the Payment Posting section of the program. Lets take a look at the different sections of this screen. Once the Customer is selected, this section will automatically recalculate to provide the most accurate payment due information possible.